Those Riverdale kids must be pretty jaded by now. They’ve been terrorized by Jason Voorhees, mended political fences between Barack Obama and Sarah Palin, beamed up to the Enterprise, and most recently stared down a Predator. And now, Deadline is reporting that Archie will be able to cross “surviving a Sharknado” off of his bucket list. As part of the promotion for Syfy’s upcoming Sharknado 3 event, a shark-spewing tornado will spill into the pages of Archie. “It’s only natural that Archie and the gang will get a chance to save their town from flying sharks,” says Syfy Vice President Jeff Li, who presumably sees flying sharks as a natural complement to every small town’s summer vacation plans. The sprawling 48-page issue of Archie will finally bring together two quintessentially American cultural touchstones. One of them is a restless maelstrom of dead-eyed monsters who are deaf to reason and compassion. The other is a tornado stuffed with sharks. 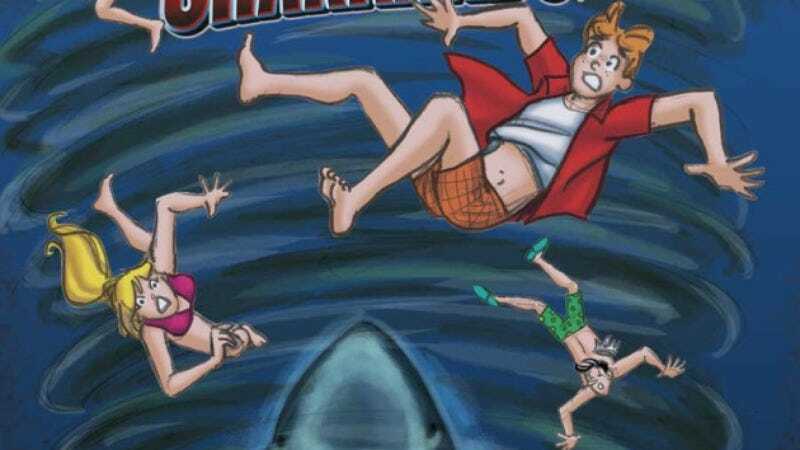 Archie Vs. Sharknado and Sharknado 3: Oh Hell No! will both make landfall on July 22.